GOLD PRICES recovered a $5 drop in London trade Thursday as the US Dollar eased back from this week’s gains on the currency market following a surprise rise in the number of Americans filing for jobless benefit claims. Leader of Italy’s self-declared ‘anti-establishment’ M5S party – now in coalition with the right-wing Lega – “The winds of change have crossed the Alps,” tweeted Di Maio after meeting self-appointed leaders of the gilets jaunes protesters, now planning to stand in May’s European elections. Having spiked to the highest since September 2017 in late January, new US claims for jobless income support last week came in only 7.5% lower, barely half the drop Wall Street analysts forecast. Priced in the Dollar, gold prices had briefly dipped below $1303 per ounce for the first time in a week in Asian trade, where financial markets in China – the world’s No.1 gold consumer market – remain shut for the Lunar New Year until Monday. The UK gold price in Pounds per ounce meantime rose to £1015 – a 16-month high when first reached at the start of January – as the Bank of England cut its UK GDP forecast to the slowest growth since the global economic slump of 2009. 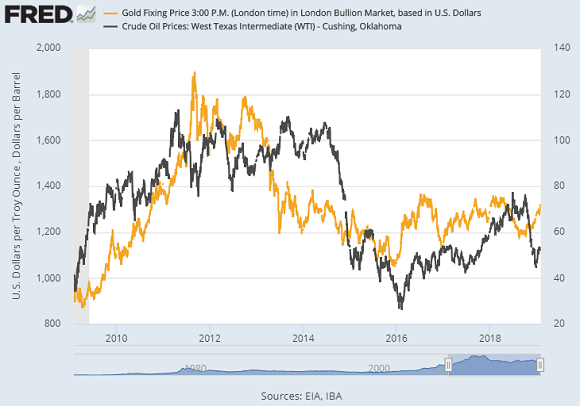 As the Dollar weakened in 2016 and again in 2017, gold prices traded higher for US investors than for non-US investors, but the metal has been stronger against non-Dollar currencies since the start of 2018. “Global slowdown concerns saw the Dollar gaining and gold moving down,” Reuters quotes one spread-betting analyst. But while gold prices are “pressured by a stronger Dollar,” says the Wall Street Journal, they “remain near their highest levels since June” in USD terms. Keeping UK interest rates near all-time lows and maintaining £435bn of QE bond purchases, the Bank of England today cut its 2019 UK GDP forecast from 1.7% to 1.2%, pointing to a drop in business investment, in new home-building, and in export growth. UK Prime Minister Theresa May meantime had “robust but constructive” talks on Brexit – set to take effect on 29 March – with European Commission President Jean-Claude Juncker in Brussels today. Further talks are now due for end-February, while UK and European Union negotiators seek “a way through” on the Irish backstop. GOLD PRICES held flat in US Dollar terms in London on Wednesday, keeping a $5 drop for the week so far but rising towards new all-time highs for households in world No.2 consumer market India. Euro gold and the UK gold price in Pounds per ounce both rose, hitting 22-month highs above €1155 and 3-week highs at £1017 respectively as politicians from the European Union and the UK got no nearer to resolving the ‘Irish backstop’ part of their Brexit deal rejected by lawmakers in London last week. Gold priced in Dollars meantime held around $1313 as world stock markets slipped after US President Trump’s annual State of the Union address called for an end to what he called “the politics of revenge” but failed to highlight any progress in the key US-China trade talks. “Relatively muted price action again for bullion during Asian trade today,” says one trading desk, noting the absence of No.1 consumer market China thanks to this week’s Lunar New Year holidays. Over in India however – the metal’s second largest consumer market – retail gold prices today reached above 33,000 Rupees per 10 grams in Mumbai and over Rs 34,000 in Ahmedabad, nearing new all-time record highs. Coming after wholesale gold prices in India last week rose to a slight premium to global quotes, these levels match the record-high Rupee cost for consumers of August 2013, when India’s then-Congress Party government rushed out a series of severe anti-gold import rules to try and stem the country’s huge balance of payments deficit, worsened by record-high gold demand amid the metal’s steepest Dollar-price drop in three decades. India today continues to charge 10% import duty on gold bullion, plus extra VAT sales tax on jewelry since 2017. Wholesale prices in the sub-continent have now traded at a discount to London on 75% of all business days over the last 3 years according to data compiled by the mining-industry backed World Gold Council, suggesting weak domestic demand against plentiful supply. “Despite high prices, demand for gold jewelry has been good, mainly due to the ongoing wedding season,” the Times of India quotes one retailer. 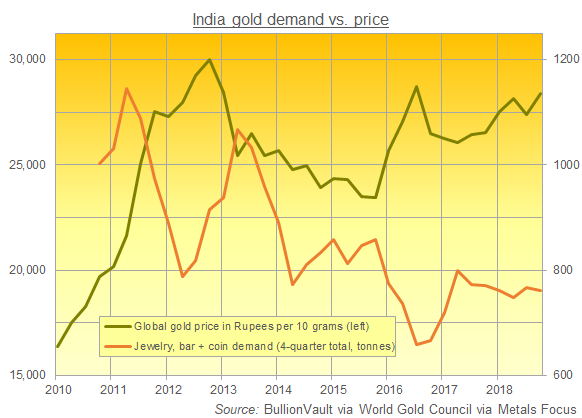 Late-2018’s rising gold price for India consumers “saw a rise in the number preferring to exchange existing gold for new pieces” said the WGC of India’s jewelry business in its global demand update last week. India’s police and Customs officials meantime report “an extra push from smugglers to bring in more quantity of gold,” reports the New Indian Express, with gangs looking to exploit today’s near-record high retail prices for legally-imported and retailed products. Following last week’s pre-election giveaways in India’s national 2019 budget – widely expected to boost gold demand in the key rural states – the finance minister of Assam today promised a raft of subsidies and gifts for the northeastern state’s citizens, including free electric bicycles for each student passing this year’s senior school exams, rice priced at just 1 Rupee per kilo for 5.3 million families, and 1 tola of gold (currently worth around $500) for brides whose families earn less than $7,000 per year. Formerly a politician for the Congress Party – dominant in Indian politics until Narendra Modi’s victory in 2015 – Himanta Biswa Sarma quit to run on the ticket of today’s ruling BJP in May 2016. GOLD PRICES slid Monday in London, losing more than $15 per ounce from Friday’s new 8-month high for US Dollar investors as No. 1 consumer nation China shut for the Lunar New Year holidays. World stock markets meantime ticked lower and oil prices hit 2-month highs amid the worsening crisis in the energy resource’s No.1 reserves holder Venezuela, plus growing US-Russia tensions. Gold bullion prices fell to $1310 per ounce as the US Dollar bounced on the currency market following 2 consecutive weeks of declines. “[Friday’s] upbeat non-farm payroll suggests the US economy is riding a strong momentum, dampening demand for safe-haven assets like gold,” Reuters quotes one spread-betting brokerage. Ending last week with the Federal Reserve holding its key interest rate unchanged, January however saw gold-backed ETFs increase their holding “by over 70 tonnes,” notes German bank Commerzbank. Due to the New Year’s partial US government shutdown, US regulator the CFTC remains behind with updates to positioning data in precious metals futures and options contracts. But new figures released Friday confirmed that hedge funds and other speculators in the Managed Money category grew their bullish betting on gold prices as 2018 ended, capping their longest run on record of bearish bets. US benchmark WTI-grade oil contracts meantime rose above $64 a barrel on Monday as supply cuts from the Opec cartel of nations, plus new US sanctions against Venezuela’s petroleum industry, spurred talk of a supply crunch. The US State Department’s move to block the sale of Venezuelan crude aims to force President Nicolas Maduro to hand power to rival Juan Guaidó – now recognized as interim leader of the Latin American nation by Washington plus Australia, the UK, Spain, France and Germany. Following mass protests against Maduro at the weekend, US President Donald Trump said Sunday that US military action is “an option”. Venezuela’s ally Russia warned the US against “destructive meddling”. With the Bank of England refusing to ship Venezuela’s gold bullion holdings in London back to Caracas since November, Abu Dhabi investment firm Noor Capital on Friday confirmed accusations from Florida senator Marco Rubio that it bought 3 tonnes of gold from Venezuela’s central bank on 21 January, adding that it will now hold off buying more amid the US-led sanctions. The BBC meantime quotes “a senior Western diplomatic source” that Turkey has been “warned” against accepting any more gold from Venezuela – most especially with “growing suspicions” that it is then busting other sanctions to re-export the metal to Iran – after importing nearly $900m-worth last year. After the United States said on Friday it will withdraw from a 1987 arms controls pact with Russia in 6 months’ time unless Moscow ends what Washington says are violations, President Vladimir Putin suspended the Intermediate-range Nuclear Forces Treaty with immediate effect on Saturday. Silver prices today fell harder than gold, retreating 3.0% from Friday’s top above $16 before rallying 10 cents to $15.82 per ounce. GOLD PRICES held 1.3% higher for the week in Dollar terms late Friday in London, trading near 8-month highs at $1322 per ounce despite much stronger-than-expected US jobs data. Rural households in India – source of 60% of annual gold demand in the metal’s No.2 consumer country – meantime got news of huge income support and tax cuts from the BJP Government, now 2 months away from national elections. With the Federal Reserve this week vowing to stay “patient” before raising Dollar interest rates, US employment rose by 304,000 in January, today’s data said, beating Wall Street’s average forecast by nearly 85%. Gold prices in Shanghai earlier rose within 1 Yuan of early January’s two-year highs at ¥287 per gram, but their premium above London gold bullion quotes slipped below $10 per ounce in Dollar terms, trimming the incentive for new bullion imports into the metal’s No.1 consumer nation as the Chinese New Year holiday season began. Wholesale prices in India meantime held a $2 discount to London, suggesting a small glut of supply as import duty and sales tax – plus this week’s Dollar price – pushed domestic Rupee prices up near all-time highs for consumers. New Delhi’s 2019 Government Budget – delivered today by finance minister Piyush Goyal – failed yet again to cut gold’s 10% import duty as dealers had hoped. But tax relief for small farmers and middle-class earners “will be good for increasing jewelry demand,” says Anantha Padmanabhan, chairman of the All India Gem & Jewellery Domestic Council. 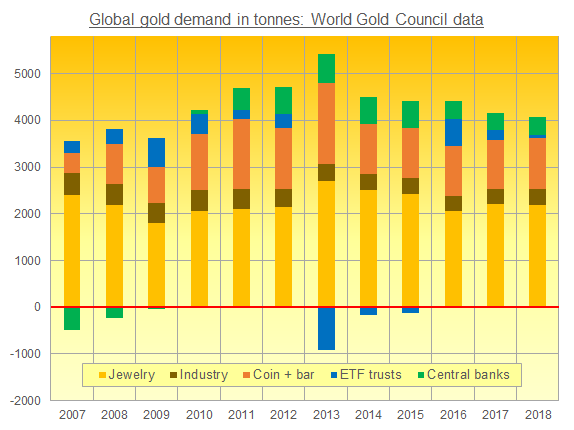 Formerly world No.1 but overtaken by China since 2013, India’s household gold demand slipped 1.5% last year from 2017’s small recovery according to this week’s global demand data from the mining-backed World Gold Council, but remained almost 100 tonnes above 2016’s multi-decade low of 670 tonnes. Standing in for Arun Jaitley – now in the US for medical treatment – Goyal didn’t refer once to gold in today’s speech to Parliament, but his supporting documents online repeat plans to develop and launch a “comprehensive Gold Policy to develop gold as an asset class” formally announced in last year’s Budget. Goyal instead unveiled a $10.5bn program of farm-income support for small landowners, and erased income tax for wages below $7,000 with further tax cuts targeting a total of 30 million middle class workers and small-business owners. Announced alongside India’s worst jobless rate in 45 years, this heavy spending by Narendra Modi’s BJP Government will widen New Delhi’s fiscal deficit to 3.4% of GDP. Today’s high prices and high tax rates on gold mean smuggling volumes could rise by another one-half in 2019 reckons Haresh Acharya at the India Bullion & Jewellers Association, claiming that wholesale traders are asking 1.5% less per kilo for cash rather than check payment, to avoid a paper trail. “Innovative” smuggling tricks discovered by India customs officials include a new “rubbery form” where gold is mixed into an elastic compound and then hidden in shoes “or even tucked into underwear” says The Times of India today. “[Gold sales are] slow despite the wedding season,” says Acharya at he IBJA. GOLD INVESTMENT prices hit 8-month highs at the start of London trade Wednesday, reaching almost $1316 per ounce in US Dollar terms as world stock markets held flat overall ahead of today’s Federal Reserve interest-rate and policy announcement. London’s FTSE100 index of mostly foreign-earning corporations rose most steeply, adding 1.4% as the UK’s Prime Minister Theresa May tried to re-open Brexit negotiations with the European Union after Parliamentary voted again last night to reject the ‘Irish backstop’ agreed with the EU for preventing a hard border on the island of Ireland after Britain’s 29th March exit from the world’s largest economic bloc. Gold investment demand among private US citizens is “off to a strong start” in 2019, says the latest weekly note from specialist consultancy Metals Focus, pointing to solid New Year sales of American gold Eagle coins. US money managers also show growing interest in tracking gold prices, with the largest gold-backed ETF trust fund – the SPDR Gold Trust (NYSEArca: GLD) – expanding to its largest size since June by last night’s close. 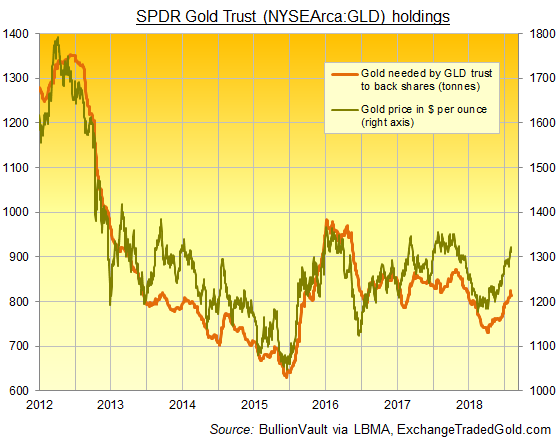 “We remain positive on gold,” says London bullion bank HSBC’s chief precious metals analyst James Steel, because “financial market volatility is up compared to last year. “Gold rallies are more likely to be sustained if investor demand is resilient and broad-based,” says the new Q4 2018 data and analysis from Refinitiv – formerly the data and risk division of global news agency Thomson Reuters. With Chinese Yuan gold prices today reaching their highest since April 2017, prices for consumers in No.2 demand nation India today neared fresh all-time record highs according to the Economic Times, with import duty and the 3% GST sales tax taking the price of 99.5% fine jewelry up to 33,815 Rupees per 10 grams in Mumbai’s Zaveri Bazaar. 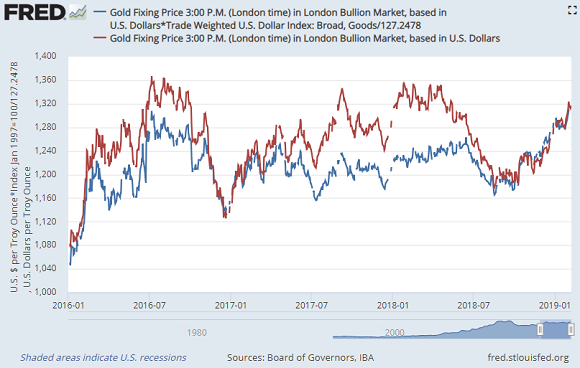 Back in London’s wholesale bullion market, silver meantime tracked gold prices higher and then lower ahead of the US Fed interest-rate decision on Wednesday, peaking within 2 cents of $16 per ounce – the highest Dollar price since July. Platinum prices struggled in contrast, slipping back below last week’s closing level at $818 per ounce. Silver prices are, on today’s average LBMA forecast, expected to show a 3.6% rise across 2019 – hitting a peak sometime this year at $17.99 – while platinum prices will fall nearly $30 to average $851 per ounce. Already slipping 3.1% so far this New Year from 2018’s record-high annual average of $1029, palladium is seen rising by almost one-quarter across 2019 on average, extending its surge on a global deficit of supply to meet demand. “[But] as the trade war drags on,” cautions French investment bank Natixis’ Bernard Dahdah – the most bearish palladium forecaster for 2019 with a view of just $900 per ounce – “we expect weaker economic growth and [auto] sales in both the US and China. Widely expected to bring no change to Dollar interest rates, today’s US Fed decision comes as UK Prime Minister Theresa May prepares to head back to Brussels in a bid to renegotiate the ‘Irish backstop’ element of the UK’s withdrawal agreement with the European Union, rejected in favor of unnamed “alternative arrangements” by a narrow majority of UK lawmakers on Tuesday despite the EU repeatedly saying it will not re-open talks. “Confronted with an increasingly irritated public…watching with mounting despair…more than a few MPs are worried about the prospect of deselection,” says long-time Brexit advocate and blogger Richard North. 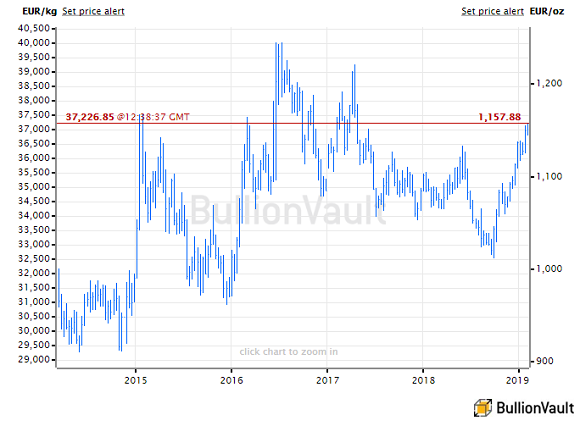 Gold priced in the so-called ‘safe haven’ Swiss Franc gold also rose to its highest since May 2018, gaining above CHF1300 per ounce, while gold prices for Eurozone investors set fresh 19-month highs above €1146. The UK gold price in Pounds per ounce held little changed however below £995 as Sterling extended its rally ahead of today’s key Parliamentary vote on Prime Minister Theresa May’s agreement with the European Union for 29 March’s Brexit. With 1 week to go until Chinese New Year – now the world’s peak gold buying festival, overtaking Diwali in India – gold prices in Shanghai’s wholesale market rose within 1.0% of early January’s spike to late-2016 levels against the Yuan. “After withstanding a test underneath $1300 in New York on Monday,” says a trading note from Swiss refiners and finance group MKS Pamp, “bullion price action remained buoyant during Asian trade today. “Today we see Comex expiry [of the January gold futures contract] with around 5,500 lots of open interest at $1300, which is likely to keep price action around the figure. Despite the partial shutdown of US government services ending last weekend, Wednesday’s GDP report for 2018 will still be delayed as the Commerce Department’s Bureau of Economic Analysis gets back to work. Friday’s monthly jobs data from the Bureau for Labor Statistics will appear as usual. Back in London, and among other amendments to May’s Brexit plan, lawmakers will vote on 2 key proposals – one calling for “alternative arrangements” to the contentious “Irish backstop”, and another calling for the Government to delay leaving the EU if no deal is approved by 26 February. A third proposal aiming to unite the ‘hard Brexit’ and ‘Remainer’ wings of May’s party – calling for a free-trade agreement using “as-yet-unknown technology” – was called “both extraordinarily funny and tragic” by EU officials and a “fantasy” by pro-Brexit Conservative newspaper The Telegraph. Shares in Russian aluminum producer Rusal (HKG: 0486) meantime extended their near-10% rally overnight, now erasing half of last April’s 70% plunge as the US Treasury lifted sanctions against tycoon Oleg Deripaska despite Democrat lawmakers pushing to maintain them. Washington meantime applied new sanctions to Venezuela’s state-owned PDVSA oil company as part of its push against elected socialist president Nicolas Maduro – already blocked from repatriating gold bullion held for the Latin American nation at the Bank of England in London. GOLD PRICES held firm on Monday near last week’s spike to 7-month high above $1300 as investors and traders await the US Federal Reserve’s key policy announcement, due Wednesday. The US Dollar rallied on the FX market after hitting 1-week lows on Friday’s report from the Wall Street Journal that the Fed may pause its sales of Treasury bonds, also known as ‘quantitative tightening’. “We think the Fed may sound more dovish and be more aligned with the market expectation of limited room for rate increases this year,” reckons Tai Hui, chief market strategist for Asia Pacific at US investment bank J.P.Morgan’s asset management division. 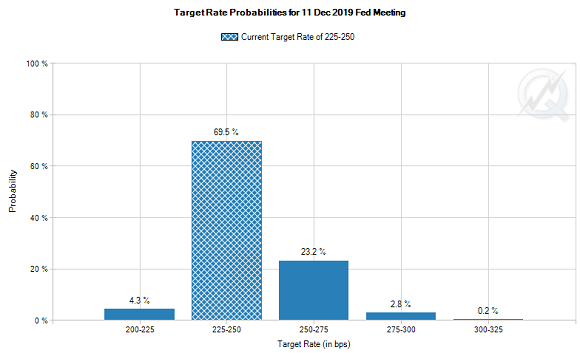 The Fed’s December forecast said it expected to make 2 or more hikes to interest rates in 2019. Betting on the futures market however sees just a 3.0% of that happening, but the probability of 1 hike has doubled to almost 1-in-4 from the market’s expectations this time last month. After signing temporary legislation to end the longest-ever shutdown of US government services, US President Donald Trump then threatened on Sunday that another government shutdown is “certainly an option”. Credit rating agency Standard & Poor’s reckons that the five-week partial shutdown cost the US economy at least $6bn – more than the $5.7bn Donald Trump was demanding for his border wall. European stock market meantime declined Monday, extending a retreat for Asian stocks, as investors waited for a new round of high-level US-China trade talks this week. Gold for European investors edged down to €1140 per ounce, just shy of Friday’s new new 17-month high. Eurozone GDP data for the end of 2018 are due out Thursday. Here in London, UK lawmakers will tomorrow vote on Prime Minister Theresa May’s “plan B” for Brexit – effectively the same withdrawal agreement rejected earlier this month by the heaviest-ever Parliamentary defeat of a sitting Government. UK gold prices in Pounds per ounce held steady at £989 on Monday as Sterling edged back from 3-month highs on the FX market, down 4% from the 16-month high of £1032 reached at the very beginning of this month.